Royal Beach, the newest luxury resort complex in Sunny Beach opens doors today with a spectacular party. Galaxy Property Group Ltd started the construction of the new five-star hotel in Sunny Beach Resort in the end of 2005. The company has also invested in parcels in or near mountain resorts in Bulgaria in where it is planning to build hotel complexes. Royal Beach is situated on an area of 25,000 sq.m in the central east part of Sunny Beach. The hotel is in close proximity with the the Cuban Hotel and Main Street and is situated just 50 meters away from the beach. The new 5-star hotel offers a uniquie combination of luxury and comfort. 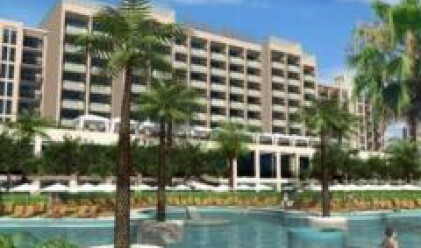 It has 143 rooms, 504 apartments for sale and a shopping area where merchants can take advantage of the lucrative opportunities the beach resort markets offers. Royal Beach is a unique independent structure of separate buildings. The copmlex offers all types of apartments for sale – from luxurious three-bedroom apartments, to smaller two-bedroom ones, and studios. The owners of the appartments have the opportunity of using the services offered by the holtel – the SPA Center, steam baths, Turkish bath, the massage center and gym, the four swimming pools, and children day care. The hotel has several conference halls, 6 theme restaurants and pastry shops, a piano and a lobby bar. Royal Beach offers a special place for shopping and fun – Royal Beach Mall. The shopping center is situated on the oldest commercial street in Sunny Beach and is the biggest on the Bulgarian Black Sea Coast. The opening party will be attended by Bulgarian politicians and celebrities, and several Bulgarian pop stars and some popular foreign singers will be performing.